What is a great way to grab the attention of a NFL star on the red carpet at the ESPYs? Just take time to compliment them. That is what happened when Taji Mag stopped Richard Sherman to ask him about his locs. When asked how he keeps his locs well conditioned against the strenuous conditions of football he simply relies on lifestyle as mentioned in the video below. 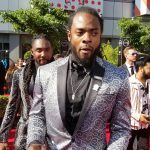 Sherman showed much humility engaging with many around him and sporting an equality pin on his fashionable jacket for the ESPYs, expressing that he believes in allowing people to be themselves and not conform to what society thinks. He has spoken out against the NFL about taking away the individuality and the freedom of players, ultimately affecting the play of the players and the ratings of the NFL. Richard Sherman is always a class act and a true display of being a positive Black man. Not only is he a pro bowl cornerback for the Seattle Seahawks, but he is also a graduate from Stanford. His education and charismatic personality have helped him dispel any negativity placed on his character from the media. Most notably is the situation with Patriots Quarterback Tom Brady, where he was called a “thug” after passionately asking Tom Brady “Are You Mad Bro?”. He let the media know how offended he was being labeled a thug and eloquently explained how it is comparable to the N-word. There are other times that Sherman has been vilified but he finds ways to defy them and he also shows compassion with his acts of kindness. During a #BlackLoveConvo twitter chat, we discussed how he recently paid the tuition of a Virginia high school student. He met her at a charity dinner in Richmond, VA and made an agreement with her that if she was able to bring up her grades her senior, he would pay her tuition. Hopefully Richard Sherman will continue to inspire and contribute to society, allowing for the Black community to have yet another positive role model.